A bloomy rind is a cheese rind found on soft cheese that has formed due to the presence of helpful bacteria called Penicillium candidum or Penicillium camemberti. Sometimes this helpful bacteria is sprayed over the wheels of cheese and sometimes it is added to the starter during the cheesemaking process. This bacteria encourages a thin, soft sometimes fuzzy rind to grow or "bloom" on the outside of the cheese. The wheels of cheese are carefully monitored during the maturation process, usually in rooms, caves or cellars that are temperature and humidity controlled. Bloomy rind cheeses are typically aged a few weeks, or sometimes as long as 60 days. The rind is usually white or beige. Bloomy rinds are entirely edible and usually an enjoyable part of the cheese. If the cheese is past its prime, the rind can become hard and cracked and have an odor and flavor that is referred to as ammoniated. In this case, it is best to avoid the rind. Bloomy rind cheese is also referred to as soft-ripened cheese. These soft cheeses are also called soft-ripened because they ripen from the outside, closest to rind, first and then slowly ripen towards the middle of the cheese. 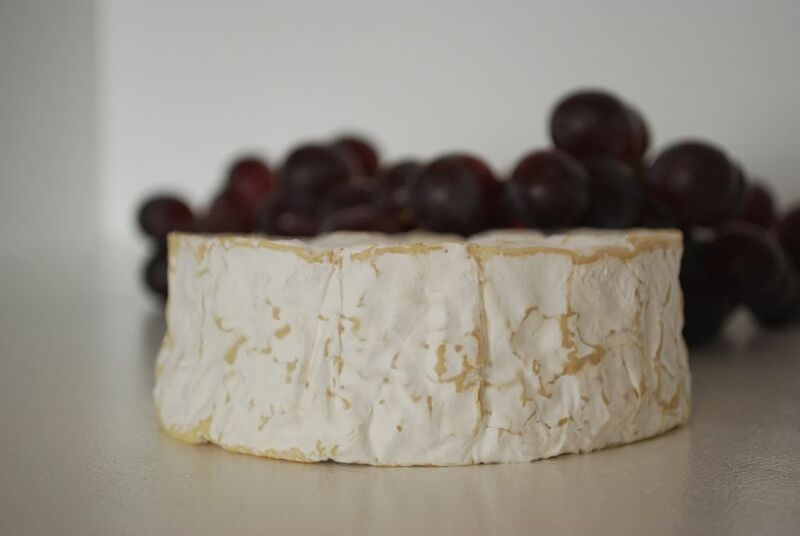 If you've ever cut into a wheel of brie that is soft and runny around the edges and firmer and white in the very middle, you've seen an example of this. Once a wheel of soft-ripened cheese has been cut into, it no longer continues to ripen. Bloomy rind or soft-ripened, cheese has a buttery flavor that matches the buttery texture. The flavor of the cheese can be mild and sweet or quite earthy, mushroomy and even spicy or peppery. It’s hard to generalize since every cheese has it’s own unique and changing flavor, but….as a general rule, the following wines are a good place to start when trying to find a good match with a bloomy rind cheese. More often than not, whites pair better with bloomy rinds than reds do. Chardonnay: A buttery Chardonnay can pair well with bloomy rinds, but a crisp, fruity Chardonnay is usually a better match since it contrasts with the richness of the cheese. Next time you’re in a cheese shop, ask to try a bloomy rind cheese. Your cheesemonger will have quite a few favorites to offer. What is Soft Ripened Cheese?